Inspired by real testimonies, Isaac Gomez’s La Ruta takes place from 1998 to 2000 in and around the large maquiladoras of Ciudad Juárez, Mexico. Disappearances and murders are frighteningly common among the women who staff these large, foreign-owned factories; the late-night bus rides home from their shifts are especially dangerous. 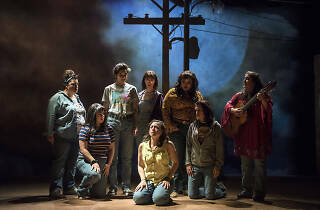 Brought to blazing life at Steppenwolf by director Sandra Marquez and a superb cast of women, Gomez’s brutally lyrical play is hard to watch, but must be seen. Sandra Delgado plays Yoli, whose daughter, Brenda (Cher Alvarez), fails to return home from work one day; suspicion for her disappearance falls on Brenda’s brash yet mysterious coworker Yvonne (the charismatic Karen Rodriguez, a frequent Gomez collaborator). Charin Alvarez portrays Yoli’s friend Marisela, whose daughter disappeared under similar circumstances years earlier. 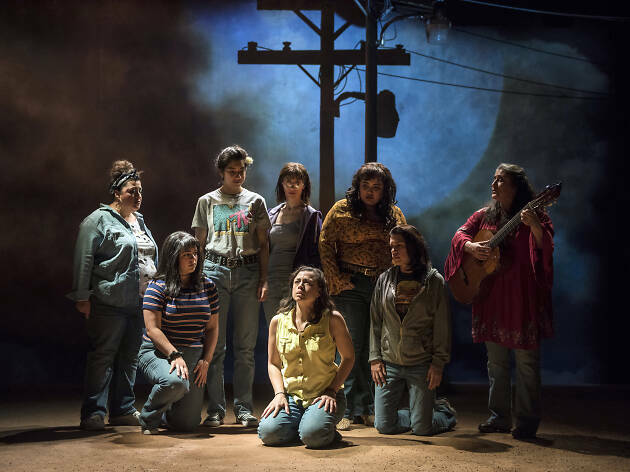 In tracking these four women’s lives, La Ruta moves back and forth across time with a combination of clear-eyed tenderness and burning rage at their mistreatment. La Ruta features live music throughout—sung by the cast and led by Lara Crotte on guitar—as well as masterfully kinetic projections designed by Rasean Davonte Johnson. These elements help bring out the show’s surreal dimensions. In his swirling hybrid of play, ballad and documentary, Gomez twists real life just enough to highlight the incomprehensible wrongness of what’s happening in Juárez: a dream that all too easily turns into a very real nightmare. Steppenwolf Upstairs Theatre. By Isaac Gomez. Directed by Sandra Marquez. With Karen Rodriguez, Charin Alvarez, Sandra Delgado, Cher Alvarez, Laura Crotte, Mari Marroquin , Alice da Cunha, Isabella Gerasole. Running time: 1hr 35mins. No intermission.